Online Pioneers – 2001 – Visionaries, or just daft? I remember talking to the Editor of one of the Menswear industry’s trade mags, at a trade show in Berlin, and explaining my plans to sell online, way, way back at the start of the decade. His reaction was bemused compassion for my ‘crazy’ plans. He didn’t have to say anything – the look on his face spoke volumes. I wasn’t sure how successful selling Menswear online would be, but I was 100% certain there was a niche, and that niche would grow quickly. The web was a totally different place back then; Facebook had yet to be born (and actually started as Facemash) Twitter and Youtube were both years away, and the whole nascent online shopping market was being disregarded by almost everyone. Undeterred by the doubters, we commisioned our first ecommerce website, and it was a beauty! 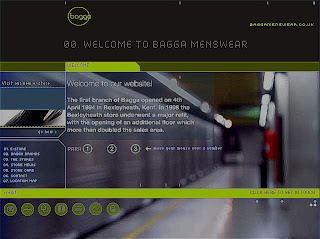 The first site was a bespoke build from scratch, and employed a cms control that I quickly got my head round. We were selling online! This really was a lovely site, design-wise, and was actually being touted for design awards. Problem was, it was built entirely using flash, and had very weak SEO. Brands on the site included D&G Jeans, Hackett, Versace Jeans, Paul Smith Jeans and loads of designer accessories. Unfortunately, the site didn’t live up to my commercial expectations, so it was back to the drawing board…….